LIPIS: The presence of Lipis PAS committee member Mahyudin Ghazali at the Lipis UMNO divisional delegates conference here not only caught the attention of the UMNO delegates, but also UMNO president Datuk Seri Najib Razak, who was there to open the conference. 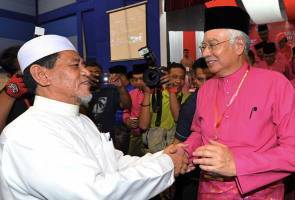 Najib, when informed on Mahyudin's presence, said never in history had a PAS leader attended the opening ceremony of an UMNO meeting. "Rarely at an UMNO conference there is PAS member (present). Man (referring to Lipis UMNO division leader Datuk Abdul Rahman Mohamad) this is an achievement," said the prime minister when opening the Lipis UMNO divisional delegates conference at Dewan Jubli Perak Sultan Haji Ahmad Shah here today. It was learnt that Mahyudin attended the event in his capacity as the imam of the Kampung Tempoyang Mosque to receive the RM1.5 million allocation announced by Najib for repair of the mosque. Najib also announced an allocation for purchase of a scanner for Lipis Hospital. Meanwhile, Najib said he regarded his coming to Lipis to "balik kampung" (come home) because Lipis was where he was born 64 years ago.
" I felt touched when several delegates shook my hands and said 'welcome home Datuk Seri'. "About 64 years ago on July 23 at the State Secretary's residence at Bukit Bius, began the journey of man by the name of Najib Razak, who is now UMNO President and the Prime Minister of Malaysia," he said.